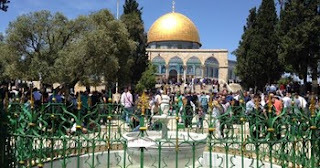 ABNA, Occupied Jerusalem - Almost 70,000 Palestinians performed Friday prayers at the al-Aqsa Mosque in occupied Jerusalem amid very tight military restrictions. Israeli authorities allowed 300 Palestinians from the Gaza Strip, all above the age of 50, to travel to occupied Jerusalem via the Erez corssing (Beit Hanoun) and to perform Friday prayers at Islam's third-holiest site. Sheikh Dr. Mohammad Salim called during Friday sermon for unity as the holy month of Ramadan approaches. He also called for intensifying Palestinian presence in al-Aqsa during Ramadan. The freedom of movement of Palestinians is a right guaranteed by international law, but a right continuously limited by Israel.